We like to travel outside of Utah with hope of locating high-quality beer. Often we meet new, like-minded individuals from out of state, and usually, two generally common questions come up: “Why does Utah have strange alcohol laws?” and “Just how the heck do you pronounce that brewery called Uinta?” (Actually, Uinta Brewing Company perfectly jokes on their website with “… are ‘U-IN-TAH’ craft beer?”—providing evidence this question may be common.) Regardless, Uinta gave us many gateway brews to the craft community and conversation starters to new friendships. 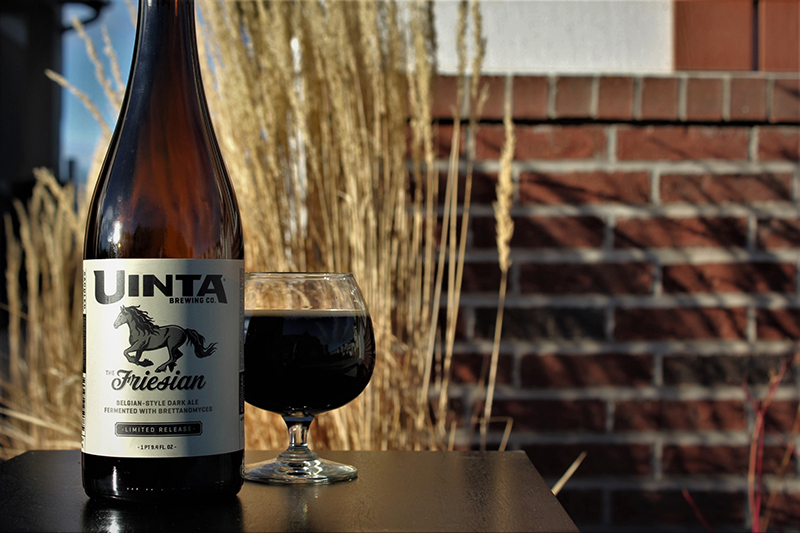 Uinta is a staple in the Utah beer scene and has been since it launched in 1993. Throughout the years, Uinta firmly established itself as a larger brewery that is still willing to take chances. Most recently, those chances are taking place within their barrel-aging and sour program. They’ve released a steady legion of limited beers, some showcasing trendy yeast strain Brettanomyces, more often described as “Brett.” A Belgian-style dark ale, The Friesian, is one of the many styles they applied this interesting ingredient to. Brett beers tend to evolve over time, as with most traditional beer. However, with this particular evolution, the changes range from subtle to downright twisted and extreme. As a result, some brewers have taken the bottle date to a different level. By declaring “enjoy after,” it presents the opportunity to maximize delightful flavors while consuming the beer. Uinta hasn’t affirmed that statement for this ale, leaving the drinking date up to consumers. With that said, we freed the top and popped the cork on The Friesian to see what magic lies within. As the beer cascades out of the bottle, a beautiful, black cherry–tinted liquid fills the glass. Instantly, a half-inch of beige fizz takes over the crown, but retreats as quickly as it arrives. What’s left of the minimized head tries to lace the glass, except the tiny bubbles fall like sand. Some Brett beers have been described as having a “horse-blanket” or “barnyard” musk or sourness to their aroma. Raising the glass, a blended fragrance of dark cherry and cabernet grapes circulate the air. The first sip of this three-month-old ale is interesting. The dark, roasted malt gives a full-bodied essence of fruit and nuts. It is almost reminiscent of a semi-tart port wine, intensifying as the drink warms through consumption. This beer isn’t overly tart, which may be a byproduct of the dark ale style used to feed the yeast. When it is all said and done, the experience is pleasing. 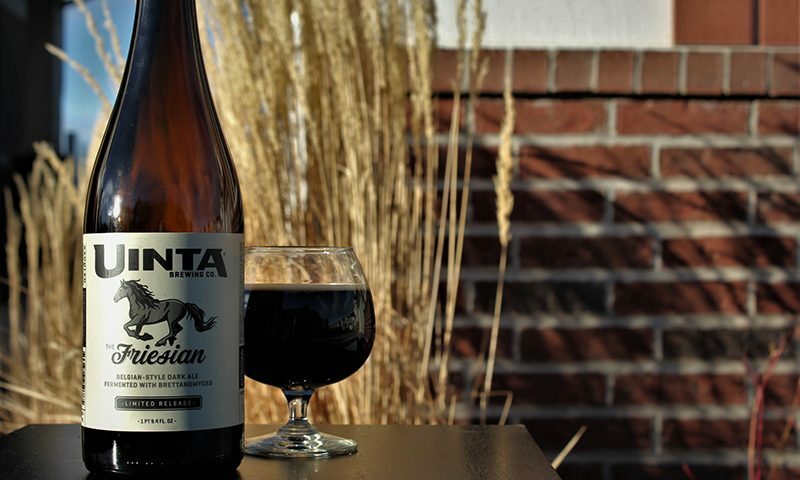 Lately, Uinta Brewing Company appears to be all in with Brettanomyces. They are allowing their brewmasters the freedom to test its powers on virtually any style of beer. We are glad to see that they’re sharing the results. Bottles of The Friesian can be found at the brewery bottle shop (1722 S. Fremont Dr.) and DABC liquor stores. If you were to purchase The Friesian and try it now, its profile may be different compared to a carefully aged one. Understanding the ever-transforming component of Brett yeast could help ease the weird and wonderful encounters with these fermented beverages. We propose, whenever intake occurs, to take your time to enjoy the beer. Sip it and benefit from all of its funky glory. Because, given time, warmer temperatures seem to bring out extra-intense aromas and flavors.